Aromatherapy, is the therapeutic use of essential oils to help maintain and promote physical, psychological and spiritual wellbeing. Essential oils being the fragrant volatile essences extracted from plants, generally by steam distillation or expression. Aromatherapy, being holistic, brings together all aspects that may effect the wellbeing of a person. Rather than only alleviating symptoms an aromatherapist would look to encompass the whole, including physical, psychological and spiritual elements effecting a client. Essential oils, generally, not only effect pathogens and body chemistry but also trigger memory and effect mood. Coupled with massage and the power of touch to release tension, aromatherapy can go a long way to support the body in it's ability to self-heal. 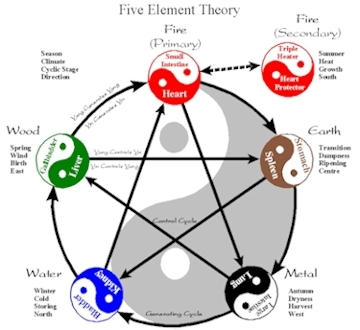 The first things I learned in my shiatsu training was the theories of Yin & Yang and the Five Elements. Subsequently these theories are fundamental to how I perceive my clients. When I finally decided to undertake the training to become an aromatherapist I found I kept turning to a book I had owned for many years that described the properties of essential oils in five element terms, Aromatherapy for Healing the Spirit by Gabriel Mojay. Gabriel Mojay's book along with another I came across, Aromatherapy with Chinese Medicine by Dennis Willmont, helped me to relate aromatherapy to my existing practice as well as transform my knowledge of aromatherapy to an instinctual short hand. One of the beauties of thinking of essential oils in Five Element terms is in creating blends to balance the conditions expressed by clients. It is amazing how inspired a blend appears when reflected upon later, when one has time to check the less likely remembered qualities, and see just how synergistic the blend was. My preference is to use either calendula infused sunflower oil, hypericum infused sunflower oil or macadamia oil. This allows the oils to have their full effect on the body. © Copyright 2010-18 John Williamson MRSS - Professional Bodywork Therapist. All Rights Reserved.